I was walking on a road with many people, all going in the same direction. All of the sudden behind my right shoulder, a huge golden beam of light from the heavens shone down and began to move across the sky in front of me from right to left. It was massive and it was evident it was not man-made. It began to engulf everything it touched. At the same time, I looked up to my right and in the skies was a huge screen. On it I saw a map of the world. It was as if I was seeing and experiencing this phenomenon from two different dimensions. I saw this all-encompassing light start at the eastern part of the map near Australia and it began to slowly move west across the entire globe. The light filled the entire sky and was full of glory and power. It seemed to move across the center of the map, touching different countries at varying degrees. I knew that what I was seeing and experiencing was global and affecting everyone everywhere. I heard myself shouting “It’s happening! It’s happening!” and my heart began to race with excitement. This light was multi-dimensional. It not only went across the surface of the earth, but went underneath in varying degrees of color and richness. The deeper it penetrated, the deeper its color and impact. It was powerful, distinct and moved with ultimate authority. I was immediately overwhelmed with joy and awe and fell to my knees as I realized the immensity of what was happening. I cried out, “It’s a sign! 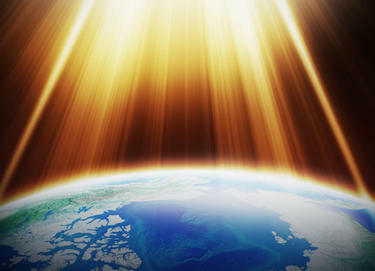 Get ready!” I knew it was His glory covering the earth. Yet, I could sense the fear around me, the uncertainty of what was taking place. As people looked up, dazed and in shock of what was taking place, I shouted out without hesitation, “He’s coming! Yes! But, for those who believe…it’s going to be AWESOME! !” I knew there would be those who would not be ready and great fear would seize them. The Fear of the Lord was coming in great glory and power and everything in its path was going to be affected. Even so, what was happening was real and it was GLORIOUS. This prophetic word which starts in the east reminded me of Isa 24.16. I come from New Zealand ‘near Australia’.. and I have long looked at and prayed for that song to come from the uttermost part of the earth..’Glory to the Righteous One’. This word rang true to me..thank you Father for preparing our hearts for glorious and awesome days to come. I concur too with the fact that it is time for the Sceptre.